Faced with steep energy costs and shrinking school budgets, cashstrapped IT directors are discovering that going green is not just good for the environment; it’s good for the wallet. With IT consuming up to 25 percent of a district’s power and today’s energy bills often topping costs in every category except staffing, they are realizing that green initiatives like power management, virtualizing of servers and desktops, and even cloud computing make good economic sense. These ideas stretch hardware dollars as well as lighten the management workloads of overstretched staffs. A Santa Ana College interns built this Green Lab, which saves money, cuts emissions, and promotes green computing among the lab’s corporate sponsors. Power-reduction efforts, in turn, help the environment by lowering greenhouse gases. Userful Corp. estimates that every year, each of its Multiplier desktop virtualization systems keeps 200,000 tons of carbon dioxide that would otherwise be generated by 10 PCs out of the atmosphere. And the cost of the company’s simple plug-and-play hardware setups is a fraction of the purchase price of a desktop computer. Some school districts may not know the amount of greenhouse gas they emit into the atmosphere. But the free calculator in the green computing section of the Consortium for School Networking’s Web site can help them figure that out. Many districts are stretching dollars and reducing emissions with power-shutdown software, like Faronics Power Save and Verdiem, that monitors usage and shuts computers down remotely, says Rick Kaestner, coauthor of CoSN’s recent report on IT budget survival strategies and director of the consortium’s green initiative. In addition, he says, school districts large enough to have their own data centers are beginning to virtualize many of their servers, saving money and energy, and reducing emissions in the process. “Schools get twice the bang for the buck” saving on hardware and annual cooling expenses (which can approach the costs of server acquisition), conserving space, and easing management workloads for reduced staffs. Recently, however, interest in desktop virtualization has grown. Traditional desktop virtualization systems, such as Citrix Systems’, haven’t gained a foothold in education, because they aren’t customized for schools and are complex and costly, according to Chris Wolf, an analyst with the Burton Group. But simpler, newer thin client systems, like those of nComputing (a competitor of Userful), are thriving, he says, because they are cost-effective, use less energy, and don’t burden the network. In March, Microsoft joined the desktop virtualization movement with the debut of its Multipoint Server 2010. As does nComputing, the Multipoint Server connects many users to one PC, saving up to 40 percent on hardware and simplifying licensing for new users. In fact, desktop virtualization generally, and nComputing in particular, appears to be booming and was also cited by Kaestner and nearly every IT manager interviewed. nComputing has 2.5 million users and is growing rapidly because of its low cost and power consumption and fast setup, which can be done in hours instead of days, says Jim McHugh, nComputing’s vice president of marketing, adding that President Obama used it to set up offices during his campaign. 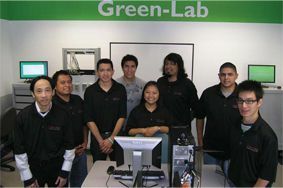 This past spring, computer-science interns at Santa Ana (Calif.) College created a green lab from scratch, installing nComputing on four PCs in a setup that is expandable to 40 stations, says Cherylee Kushida, technology grant coordinator. The nComputing installations were “a snap,” according to Nick Quach, Santa Ana’s IT director for academic services, and are expected to save the school 81 percent on energy and 69 percent on hardware costs. Other cost-saving tools include Webbased portals like Classlink. Hudson Falls (N.Y.) Central School District uses ClassLink to provide its 2,400 students with “anywhere” access to personalized content. ClassLink has saved the district $40,000 by monitoring application use down to the classroom level, enabling Hudson Falls to discontinue, reduce, or reallocate software that is underutilized, says Greg Partch, director of education technology. At the same time that it implemented ClassLink, Hudson Valley began installing 1,400 Hewlett-Packard thin client machines, which have fewer emissions because the processing power is centralized in the server. The thin clients have cut annual power costs by 88 percent, a savings of $48,000, and lowered air-conditioning use and were cheaper to buy than full desktops, Partch says. But the best benefit of the HP thin clients, he says, is centralized management; all the upgrades and patches can be tested on one server, replicated to the other 11, and then pushed out to 1,800 desktops automatically in an hour. “There’s no way we could manage 1,800 desktops without this,” Partch says. By virtualizing desktops, servers, and storage networks, Judson (Texas) ISD, near San Antonio, a CoSN green certified district, has saved millions of dollars and improved service. Judson uses nComputing in elementary classrooms, cutting deployment costs in half, and runs Citrix XenApp thin clients in the higher grades, says Steve Young, chief technology officer. Though the latter doesn’t save energy, he explains, it extends the life of older, CRT machines. The district is also saving money by automating computer shutdowns, which it accomplished for $150,000 by writing its own script, he says, instead of paying $5 a computer for a software application. Judson will also look at Schoology, a free open-source course-management system, and Microsoft’s new online school suite, which has email and other programs. “Certainly, if someone wants to manage 20,000 email accounts, that’s very attractive to us,” Young says.